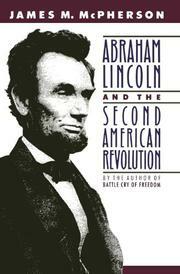 McPherson follows up his sprawling Pulitzer Prize-winning Civil War epic Battle Cry of Freedom (1988) with a real change of pace: sparkling analytical essays on how Lincoln effected the most fundamental transformation of American society since the American Revolution. Picking up Charles Beard's concept of the Civil War as a second American Revolution, McPherson examines how the conflict "left a legacy of black educational and social institutions, a tradition of civil-rights activism, and constitutional amendments that provide the legal framework for the second Reconstruction of the 1960s." The seven essays woven around this theme--originally either delivered as lectures or printed in such publications as the Hayes Historical Journal and Journal of the Abraham Lincoln Association--are, as befitting their origins, more academic and analytically rigorous than McPherson's earlier great narrative. In the opening and closing pieces, the author convincingly takes issue with the postrevisionist notion that Jim Crow laws wiped out all the advances toward freedom made by the Civil War. On the contrary, he demonstrates, the Union victory forever broke the South's "Slave Power" over the federal government. As thoughtful as these contentions, and more original, are essays on how Lincoln masterfully employed parables and figurative language to define the war's purpose, how he gave the war revolutionary momentum with his demand for the Confederacy's unconditional surrender, and how, unlike Horace Greeley and William H. Seward, he pursued a central vision of the conflict. Skillful as McPherson is, however, he can't disguise the fact that, because these essays approach the same theme from shifting points of view, the anecdotes buttressing his arguments sometimes sound recycled. Filled with the author's usual erudition and lucidity of style--although one wishes for a little more steak to go with the sizzle.